All of us like good entertainment. But would you fly 3000 miles and have your wife drive 15 hours and almost 1000 miles to meet you for a secret rendezvous in the Twin Cities just to go to a movie? To be fair it was part of a meeting with an editor friend for a book project that I am working on and a road trip to Deadwood, South Dakota and then home to Denver for a couple weeks before I head back to Alaska. 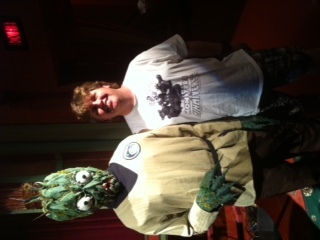 The movie was the world premiere of Christopher R. Mihm’s Attack of the Moon Zombies! 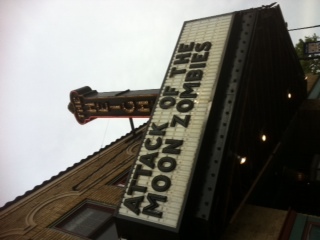 Moon Zombies premiered at the Heights theater in Columbia Heights, MN. The Heights is one of those cool old school-type theaters that our great country is losing at alarming rate, giving way to I-Max, 3-D and twenty screen stadium seating multiplexes. What a shame. Before the show Dr. Ivan Cryptosis emceed introducing the film and the man behind the madness, Christopher R. Mihm. The movie was everything that we would expect from Mihm. True to form bringing back some of his characters from previous films and that quirky 50s drive-in horror/sci-fi style that kept the sold out audience on the edge of their seats. Moon Zombie’s peppered humor with some serious acting from Sid Korpi (Administrator Ripley), Mike Cook as Dr. Vincent Edwards and the fan favorite, Michael Kaiser as Glen Hayes. What would a 50s-style B-Movie be without a damsel in distress? Of course Moon Zombies covers this with a brilliant performance my Shannon McDonough and her screams! Of course we have to have a monster. In Moon Zombies we have plenty of cabbage-headed zombies lurking around that scoop up their victims as quick as you can toss a salad. With Mihm’s trademark bug eye’s the monsters paid a great homage to those creatures from the films of yesteryear. While the effects are cheesy and low budget (they are supposed to be) they work! After the film they gave out schwag and a meet and greet with the stars and a reception followed with cupcakes and an ultra-cool Moon Zombie’s themed cake that would give Food Network’s Ace of Cake’s a run for their money. Even though I was going on 24 hours without sleep at the time of the movie I would have to say that this movie kept my attention and was some of Mihm’s best work. This type of filmmaking is what the world needs these days. It is just plain fun. Fun for the whole family in fact. Yes, the effects are corny and the million dollar sets and CGI of today’s big budget features are in a far off land, but that doesn’t discourage Mihm. Moon Zombie’s was filmed almost entirely in Mihm’s basement. The Mihmiverse is deliberate and out of this world. You have to check this guy out. You can buy all of his work on his website for less than 10 bucks a piece. Few independent filmmakers have put out a movie a year like Mihm has since his first effort in 2006 with The Monster from Phantom Lake. I would venture to guess that few have been as successful as Mihm in his passion and it shows.